Many companies hold valuable intellectual property that they don’t monetise or worse take any form of an advantage of. This could be legally protected IP such as patents. But it may also be non-protected industry-leading knowledge in one business area. In the early 90s, Apple was struggling. They were working on a personal digital assistant (PDA) called Newton of which many design features have been reused in the iPhone 1G almost 15 years later. During Newton’s development, Apple decided to outsource the development of Newton’s microprocessor. But they took a very different approach than most companies would have done. Most companies would have written specifications for the required microchip and fully outsourced it to one vendor. At the end of the day, Apple was not in the business of developing and selling microchips. However, they must have felt there is value in the technology and that they have valuable knowledge to contribute to its success. The prognosis turned out to be more than right. The joint venture that resulted from this decision was called Advanced RISC Machines Ltd, later simply ARM Ltd (now ARM Holdings). Apple’s invested $3m for a 30% share of the venture. By 2015 more than 86 billion ARM-based chips were shipped (14.9bn 2015 and 12.1bn in 2014). ARM is a master on capitalising on the intellectual property (IP) and their innovation knowledge. Most of their revenues come from licensing fees and royalties. ARM licensing out the (a) architecture of their design to those companies that design and manufacture microprocessors. Or (b) they sell their concrete design to those that manufacture the ARM processor design. Both approaches are similar with approach (a) being more upstream. There is a lot anyone of us can learn and apply to their job. Firstly, you don’t need huge teams. The lead developers of the original ARM team decided to develop their own microprocessor based on the realisation that their peers had as small R&D teams as one person. And you don’t need huge budgets. As mentioned before Apple held a 30% share of a $3m investment, making the overall joint venture a $10m endeavour. Every day thousands of projects get kicked off with larger budgets than this. Of course, if you add the R&D teams that work on the development of the ideas, things will immediately get much larger. Teams of over 1000 engineers are normal for products like the iPhone 1G. And this is one of the striking differences of the IP business model. By focussing on the architecture and design ARM always had much smaller teams than any fully vertically integrated microprocessor company (like Intel). Take from this: great knowledge is often within small size (but great) teams. What significant opportunities are you missing out by not making the most out of your knowledge? Knowledge often sits in pockets of excellence within your organisation. It may be knowledge that has been built over years by a small group of exceptional (and passionate) people. We are talking about industry-leading knowledge in one (or many separate) area(s) of your company. This may be upstream knowledge. But it could also be knowledge about the consumer as Apple demonstrated in their prediction of the mobile microchips market. You might be a department manager, group leader, an executive or a passionate individual within your company who senses they should be able to make more with their innovation ideas. Let’s look at the circusstances that have supported ARM’s success as well as the actions they have taken to make use of those opportunities. We are using insights gained from a Centre of Technology Management working paper and many other sources. The three partners in the initial ARM joint venture played their role. Apple was the end user holding valuable knowledge the requirements for a specialised processor. Acorn had developed the predecessor of the microchip used for the Apple Newton. They held the architectural and design knowledge for the microprocessor that Apple required. VLSI was the manufacturing partner. All partners had some overlap of complementary knowledge. Similar triangular relationships have proven valuable especially in the early days of ARM. One of the AMR’s next big contracts was to evolve their micro processor to meet the requirements for Nokia’s mobile phones. The manufacturing partner in this case was Texas Instruments. Nokia was the end-user. You may be any one of these in a triangular relationship. Look around to find synergetic relationships that can enhance the value of your knowledge to a commercial end. ARM was founded at a time where the computer industry had shifted from vertical to horizontal integration. Even within the microprocessor industry increasing specialisation was occurring. The below is a (very) simplified structure of this industry. The truth is much more complex, especially if you add the complementary industries such as software into the picture and the various end-user industries. A simplified view of the processor manufacturing chain (source: alexvoica.com). You can check our more details of the vertical disintegration of the value chain in the semiconductor industry and where ARM is positioned in this presentation (slide 33). On the diagram, you would see ARM at the very left-hand side as one of the IP “vendors”. But the terminology is inaccurate. The major opportunity is for the most upstream party to coordinate the contribution of the further downstream parties through a thorough understanding of the industry ecosystem and by being a champion of the customer’s requirements. This is exactly what ARM has done and the next points will give you more insights into this. Such an industry structure requires (compatible) modularity and standards. One of ARM’s major paradigms was to contribute to standardisation and incorporate existing standards where ever possible. Maturing industries transition to vertical disintegration. And in some cases, this happens earlier. Think of emerging industries such as self-driving cars, the internet of things and other. If you have the ambition to run an IP business model one of your biggest opportunities is to understand extensively well the industry-landscape, including adjacent & complementary industries and your customers industry. The ARM JV was created because the prevailing microprocessors were not suitable for Apple’s Newton. The dominant microprocessors (Intel, Motorola, IBM, etc) were optimised for the bigger, faster, better paradigm. The ARM processor was significantly smaller, required much less power and had a reduced instruction set. It was cheaper and more suitable for a mobile device as the Newton. At the time the possible field of applications was still limited (automotive was one of the growing markets). Compare this to the present situation where you will find micropossors in dozens and hundreds in the durable goods a single person owns. Processors add additional functionalitly and have found their way into industries as automotive, healthcare, infrastructure, internet of things, mobile, smart homes, wearables among many others. One of the biggest risks of an upstream IP business model is the risk of information asymmetry. If you don’t manufacture the object of your IP you don’t know the issues that your design may have and the opportunities for improving the design. Also, you will be missing out on the in-service learnings that the end-users’ experience will bring. All this knowledge will go to the manufacturer. This means they have your knowledge plus additional knowledge that you don’t have as the designer (or architect). For this business model to work it is essential to get away from a fire-and-forget (your IP) approach. You can do so by crafting into the agreements a feedback loop from the manufacturer as well as from the end user. You can find ways for business development of the end markets. Investing in acquiring knowledge of the manufacturing process. Of course, this leads to the next problem, being moral hazard. How do you know that the downstream party will give you the feedback information you have agreed upon in your contract? Many sources point out the partnership relationships that ARM has nurtured. If the downstream partner knows they will benefit from providing feedback in form of support, this will be a valuable first step. Also, ARM being in loop with the end-user and gaining understanding of how the processors performs will reduce dependency from the manufacturer. Further on licensing out to many different industries manufactuers and end-users will reduce dependencies on any individual company as such. Building a large network of partnerships has been identified as one of the key success factors of ARM. I consider partnerships as one of the linchpin concepts of the IP business model. A key ingredient to make the IP business model work is to keep learning (on organisational level). An organisation can learn from various sources and in various ways. The concept “absorptive capacity” describes a company’s ability to identify, assimilate and commercially realise relevant information. Your organisational learning should include the various learning styles, such as visual, aural, verbal, social, physical (e.g. exploratory prototypes) etc. It should include professional exchanges with internal and external peers and specialists. The image does a great job reflecting the results of many studies on this topic. But it should not appear daunting. You and your teams can start simple This needs to not be as complicated as it may appear. But there should be some system to it. Establish some sort of routines covering learning from a wide variety of external sources. It can start small. Establishing some system & routine will go a long way. 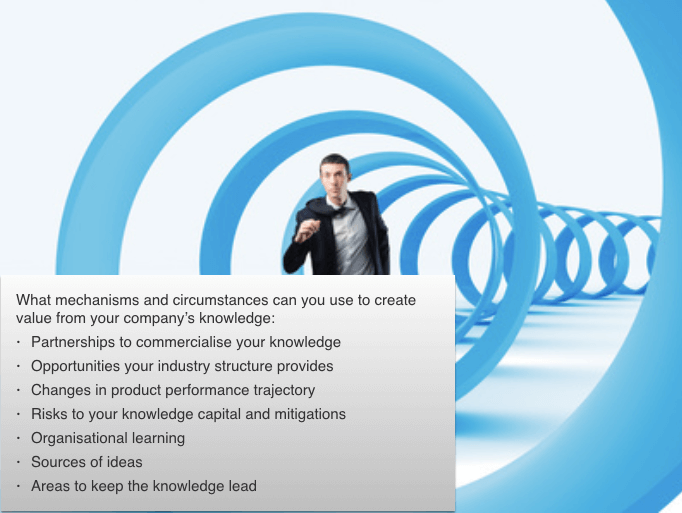 Many large organisations have embarked on implementing knowledge management system. This will help with the often observed phenomenon in large companies where different employees work on similar (or even the same problem) without knowing of each other. Or that solutions have already been found within one company which other employees are still trying to solve. From this, you will understand that thee must also be a cultural and organisational element to this, especially in large firms. With all this said – don’t miss the forest for the trees. 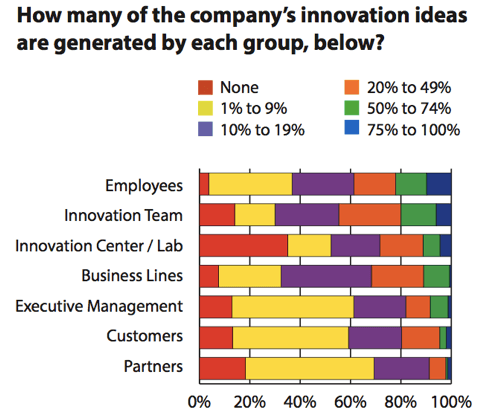 Some of the most successful innovations have been made by small teams (see the image on team sizes above). You can get immersed in building complex knowledge management systems, KPIs for tracking your “IP” etc. but never achieve any substantial outcomes. It is important that the assimilated knowledge is put to work fast if only for exploratory or evolutionary prototypes on some sort of relevant problems. Present at conferences or other events or apply in consulting contracts and so on. Think about the knowledge exchange with your downstream partners and the end-users (and their customers as feasible). 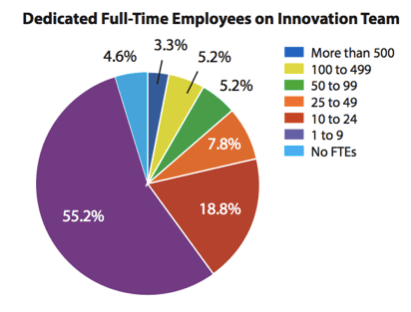 This survey demonstrates one of the reasons why an IP / knowledge business unit requires connectedness very well. Being successful with a pure IP business model is quite a feat. ARM is most likely one of the largest of its kind. Their achievements are impressive. Having over 86 billion of their chips manufactured without manufacturing a single one of themselves impressive. And so is being able to evolve their design that it still remains state-of-the-art over several decades whilst keeping abreast of those that capture the downstream IP is remarkable. It is clear that this can only be the outcome of a race that basically will never stop. As you contribute to your industry’s progress, as your partners learn and as your customers get better products, you will need to be already working on the next evolution step. Most firms do not have a pure IP business model which is why you can learn greatly from ARM (who have a pure IP business model). For anyone who wants to make more revenue from their innovation knowledge ARM is worth an in-depth study. It can help R&D or specialist departments within (larger) corporates to open additional revenue streams. And even if you have just realised that your knowledge may be much more worth than you had reapplied so far, that will be a great start. Even a 5 minute brainstorm will help trigger your subconscious thinking and broaden your horizon for bigger, better ideas over time. Copy & paste to your note-taking app and jot down what comes into your mind. What partners do you have (or could you make) with valuable complementary knowledge? What triangular partnerships could help you commercialise valuable IP / knowledge your company holds? How horizontally / vertically integrated is your industry and adjacent/customer industries? What is the product performance trajectory in your industry and what could be early days of an emerging trend? What would be the risks of sharing your knowledge with partners and how could you mitigate the risk? What can you do better to increase your absorptive capacity (organisational learning)? Where could ideas come from and how could you facilitate this process? How can you retain the lead- which specialised field can you do this on? IP / knowledge, when pursued in the right way, can make or break a company. Separately, Google also signed a nonexclusive licence for HTC intellectual property. Download now, read now (or later).